Trade surveillance technology’s budget allocation has expanded at an average annual rate of 12% since 2010. Boston, January 10, 2017 – The complexity of trading activities and the vast amount of both structured and unstructured data involved in trade surveillance and compliance—including trade reconstruction—necessitate specialized, often cutting-edge technology. Moreover, expertise among compliance personnel is required to leverage said technology. The success of the firm’s compliance department in this area is essentially a zero-sum game; even a small failure in detection can have catastrophic results in the event of a regulatory breach. 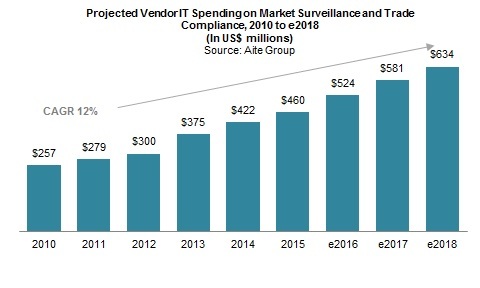 This research updates Aite Group’s 2015 compliance budget analysis, analyzes the current and future trade surveillance and compliance spending, and includes insight into key functionality provided by trade surveillance technology vendors. It is based on proprietary Aite Group research as well as data collected in surveys executed by Nasdaq and Aite Group in 2015 and 2016. This 21-page Impact Note contains 20 figures. Clients of Aite Group’s Institutional Securities & Investments service can download this report, the corresponding charts, and the Executive Impact Deck.